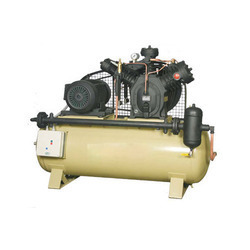 ZUM-AIR Multi Stage High Pressure Air Compressors are designed for High Pressure Applications. They are available in two & three stages in two or three cylinder versions. Cross Head Cylinders are used in the final stage small diameter piston for better support. Air Blast Circuit Breakers, Gas Distribution, Defence, Engine Starting, Pneumatic Testing ... etc. They have a wide operating range for high pressure application, from 20 kg/cm2g to 70 kg/cm2g and our available in air as well as water cooled version. They have a good utility in pet bottling. Ingersoll Rand multi-stage high pressure air compressors are designed for high pressure applications. These compressors have extra heavy-duty components and are designed for minimum maintenance and maximum performance. 1. 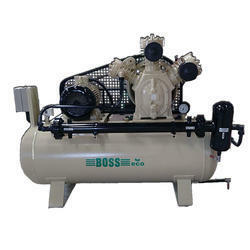 Multi stage high pressure compressors are designed for high pressure operations upto 70kg/cm2. - Embraco High Efficiency Compressors for a wide range of refrigerants. - Compact, Low noise & Low vibration levels. Specializing in High-Pressure Air and Gas Compressors (HPAC) for Industrial, Offshore and Naval Applications. Suction pressure anywhere from atmospheric to 20 bar and will deliver air or gas at any pressure from 10 to 400 bar with flow rates from 250 to 2000 m3/h. - Chlorinated solvents for washing no longer required. - Higher protection for working condition. - Better raw material saving.